Over the past week the Southwestern Wisconsin corn crop has progressed very quickly. We went from being able to still apply fertilizer last week to being fully canopied in a week. Beans are still really short, but haven’t had much in the way of stressors or insect pressure yet this year. 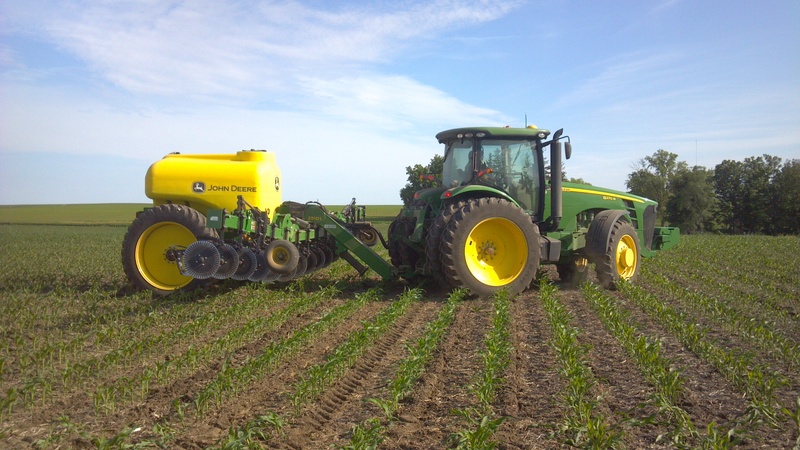 On June 7th we started out the first 2510L applicator that the Cuba City store had sold. The 2510L was a 15 row with a mole knife for placing the nitrogen below the surface. The customer was very impressed with the speed that it was able to run without having soil “blowouts” in his field, and also how accurate the rates were. As with any nitrogen application, it is crucial to apply exactly the amount that you want to apply where you want to apply it and also at the correct time for the plant’s needs. 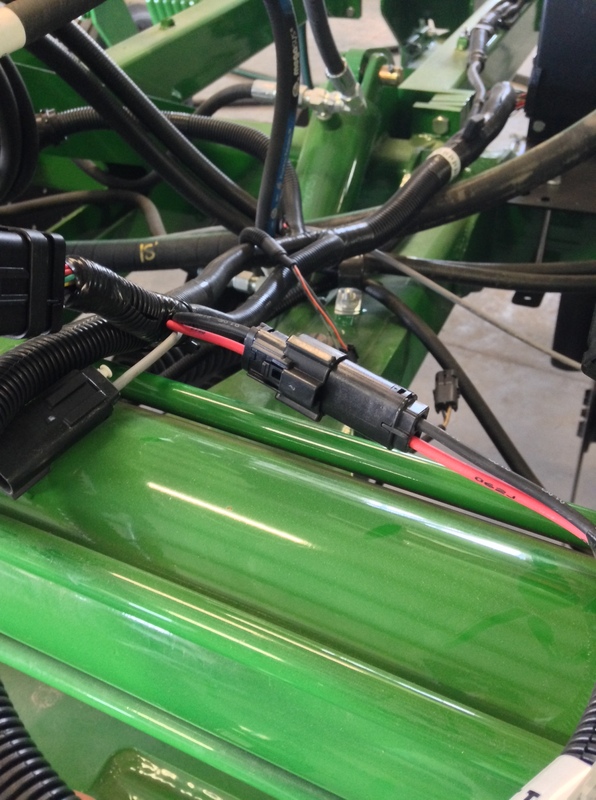 In addition, the applicator was very easy to set up and run due to the John Deere GS2 rate controller being ordered out of the factory. On June 14th, Cuba City had their annual Home Town Fest which includes two nights of tractor and truck pulls, amusement rides and also a parade. The parade has been a crowd favorite with hundreds of spectators every year. This year Sloan’s had a five pieces of equipment to showcase, including a 550 S-4 gator, a new R4030 sprayer, a 6170R tractor with 946 discbine, a 9360R tractor with 2720 disk ripper, and a W235 self-propelled windrower with a 995 16’ head. Parade goers enjoyed seeing the big new green equipment, even going as far as stopping me en-route and asking what a windrower does. It just goes to show how disconnected from agriculture people have become even in a small rural community such as Cuba City. Everyone in agriculture needs to go the extra mile and promote all the hard work we do, and just what kind of investment and commitment it takes to keep feeding the world. Pictures from the parade can be on Sloan’s Facebook page by clicking here. The majority of the crops have been planted in the Central IL area. A few customers are still finishing soybeans and with the current weather forecast should be finishing up with those by next week. Several customers have been side dressing with liquid and fast bars. I have seen a couple of height switches that were out of adjustment and it is always a good first place to look when having problems with product application. You can find the height switch status under the book and wrench tab in the rate controller in the readings drop down box. It will read “Switches/Status”. I have spoken with several customers that are still having issues with section control setup and offsets. It is very important to double check your equipment offsets throughout the season and make sure that the measurements you have input are staying there every time you cycle the key when using the R series tractors. I suggest taking a picture of them with your phone or writing them down on a piece of paper you can leave in the armrest for quick reference upon start up. Hopefully this issue will be resolved soon but for now it is better to be safe than sorry. I have also seen two instances where the connector pictured below causes problems with correct operation of equipment. Once on a 1770NT 24 row, the connector was just not pushed together enough and was causing intermittent problems on the GS3 display and not allowing proper operation of the planter. The second situation was on a new 2510L that the customer had just taken home and was preparing to use. The customer put water in the tank and attempted operation of the tool and the valves would not turn on allowing proper product application. Examination of the connector and a tug on the wires pulled the ground wire out. After proper replacement of the wire and insuring the connector was pushed together well, the tool worked just like it was supposed to. This connector is found on many John Deere machines and on the rate controller harness. The last situation was on a rate controller harness.